Jim Fitzgerald, now-retired FBI criminal profiler and forensic linguist (one who analyzes language as evidence), recounts what it was like growing up from the mid-1950s to the mid-1970s in his Philadelphia neighborhood, and parts slightly beyond. Antics, pranks, weird people, inspirational people, cool people, funny people, and serious and humorous anecdotes alike, are shared for the first time for all to read in his very personal and insightful memoir spanning 20 years. Each of these experiences would serve to shape and form Jim’s later successful profiling and forensic linguistic career in the FBI and provide him with the foundational framework to help him solve some of the biggest crimes in U.S. history, and some of the smaller ones too. JCM Book I, the first of Fitzgerald’s autobiographical trilogy, takes the reader back in time to innocent and carefree days as he comes-of-age during a culturally transitional time in American history. Growing up in a row home in his modest Philadelphia neighborhood of Olney, he experiences various characters and life-situations which while somewhat odd and unusual, are at the same time edifying and character building, whether young Jim realizes it then or not. In JCM Book I, the reader will find Jim Fitzgerald as a good kid from a good family who, nonetheless, didn’t always do everything necessarily the right way during his tender years. 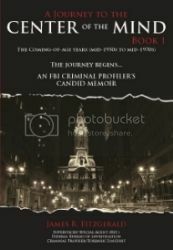 But, he eventually got it right, finally saw the light during his Penn State University years, definitely came-of-age, moved onward and upwards, and after a stint as a downtown Philadelphia department store detective, began what would become a 31-year career in law enforcement, and a very successful one at that. Enjoy the beginning of Jim Fitzgerald’s life story, from his very early years to his graduation from the Police Academy, in A Journey to the Center of the Mind, Book I. Order A Journey to the Center of the Mind Book I on Amazon, click here. Order A Journey to the Center of the Mind Book I from Infinity Publishing, click here. Chapter 6A-Bonus Chapter – A Journey to the Center of the Mind, Book I, click here.